Evan Blass, better known by his @evleaks Twitter handle, has disseminated a press image of what could be the Motorola Moto E3. The only clue that the tipster posted on the tweet was the statement "Say hello to your little bro," which would seem to indicate that this would be the the low man on the Moto totem pole and not the Motorola Moto G4. UPDATE: Evan Blass finally revealed that the image we see in this story is actually the Motorola Moto G4. The reference to the "Little bro" had to do with the larger Motorola Moto G4 Pro. Both phones will be unveiled in just two days. 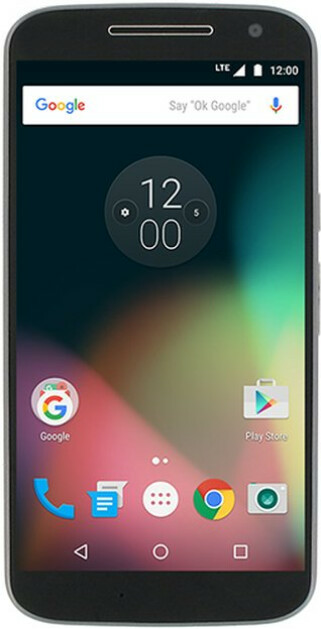 We do expect to see the Moto G4 and its higher-spec'd sibling, the Motorola Moto G4 Plus, unveiled this Tuesday May 17th during media events being held in New Delhi and Mexico. Both of those two models have been seen in previous leaks with the Moto G4 Plus featuring a fingerprint scanner embedded in the home button. We have also passed along images of what is alleged to be the front panel of the Motorola Moto X4. That phone also carries a fingerprint scanner in its home button. And sporting the same ShatterShield technology employed by the Motorola DROID Turbo 2, the Moto X4 will apparently be equipped with a shatterproof display. As we get closer to Tuesday, we expect to see more leaks come our way. No worries though, as we are just a few days away from getting information directly from the hourse's Motorola's mouth. looks like a nexus 5. It looks like Galaxy Nexus I9250. It does, especially with that wallpaper. I miss my Nexus S. I loved that little phone. looks way better than with that crazy front fingerprint scanner. Duuuude...it looks like the Nexus 4 on Jellybean. So nostalgic! We don't know the back design yet though. Exactly what I was about to comment. but this is the G4! Any leakes of " moto x force 2"
Hahaha, it looks like it IS the G4!!! Stop lying or saying what you have no idea about.. The vector thin will be the most gorgeous phone in 2017 along with the S7E and the iPhone.. With what I saw, I don't even know how moto managed to put a 2,600MAH battery in it.. The amps are dope looking and will sit flush with the phone when attached to the back of the phone..
How is this person 'lying'/'saying what they have no idea about'? Their opinion is that this device looks better than the Moto X4, which is does. Moto X4 is ugly as sin. Any updates on "moto x force 2"
Any updates on " moto x force 2"
I can just hope. I would love to buy a galaxy nexus with same specs as J7 at similar price or less. Hybrid of the Galaxy Nexus and Nexus 4. Seriously hope this thing has at least a 4xx chip and 720p display. Good clean and simple design, exactly what we want in a stock Android phone. Why in earth did they butcher the G and X designs to be beyond ugly.